ZippySig is a new, intuitive, online email signature generation application to help people easily create free email signatures for their business. You can create awesome looking signatures in just seconds. Outlook, Gmail and many other email clients are very picky in how they handle HTML signatures. If you try and create a HTML signature without using a generator, it will not only take you a long time, but you will likely run into problems such as signature mangling when replying or forwarding emails. These problems can be quite hard to troubleshoot and can cause hours of frustration and testing to get it right. This is why ZippySig have professionally made email signature templates that have been thoroughly tested to ensure they don’t break and are ready for use. 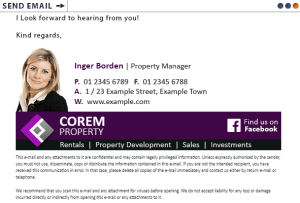 Creating a signature with ZippySig takes around 5 minutes of easy step by step email signature design configuration. Once you have created a new email signature, you have the option to save it into your email client and start using it or duplicating it for another email profile. When creating your signature, you have many options such as adding images, changing fonts, font sizes, font colors, and all details such as valediction, your business name and address etc. Using an email signature generator can help you create/configure a properly formatted HTML email signature that won’t break. Give it a try now. After all, its a free cloud-based, email signature generation tool online at ZippySig! @ free it’s the cheapest priced email signature generation service in the world.